The first philosopher whose epistemology and ontology I actually admired and bought (to put a Jamesian cash-value on it) was that of C.S. Peirce. His fallibilism, level-headed pragmaticism, arresting phenomenology, and pioneering semiotics impressed me as the right sort of theoretical foundation. 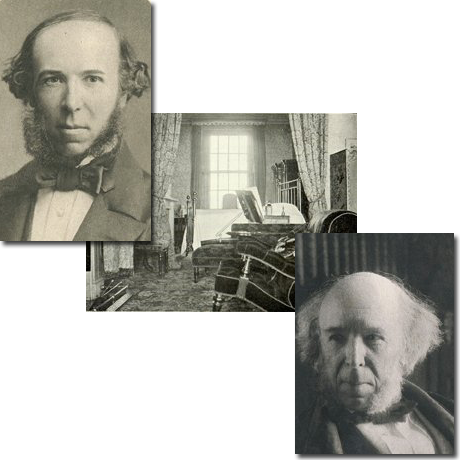 So when I read, a few years later, Herbert Spencer’s work, the part that struck me as the least satisfactory was the first part of First Principles, that is, the doctrine of The Unknowable. How unpragmatic! But a few days ago, while thumbing through the book once again, this time to mine it for a few aphorisms for Wikiquote, I was struck by something: Spencer’s ontology didn’t seem so nuts after all. Ultimate religious ideas and ultimate scientific idea, alike turn out to be merely symbols of the actual, not cognitions of it. Why do symbols matter? The simple fact is that our knowledge is based on symbols — the words and sentences, numbers and equations, signs and sign-sets that we spin in our heads and write on paper (and, now, computer documents). The not-so-simple fact is that this is limiting. Further, as he states over and over in the chapter on The Relativity of All Knowledge, all our conceptions are comparisons, relating and contrasting one notion with another, just as we contrast thing against thing, motion with motion, and measure one thing by another. When, in the past, I’ve identified truth as a certain function of the relation of signs to things signified, I was trying to make a similar point. But many philosophers, when they talk about Truth and Knowledge and the like, they don’t like these humbler definitions and conceptions of truth and knowledge. They want a more absolutist conception, they want a Singular Notion. I confess: I’ve always had trouble grasping what they want. They seem to demand too high a standard for knowledge, too high a standard of truth. My response has been: they are grasping at something that doesn’t exist. The best we can do is make our signs signify the signified in such ways that we map the signified world in its manifold permutations, as best as we can. Hoping for knowledge of things in themselves, in some sense directly and internally without the mediation of signs, is futile. What must we say concerning that which transcends knowledge? Are we to rest wholly in the consciousness of phenomena? Is the result of inquiry to exclude utterly from our minds everything but the relative? or must we also believe in something beyond the relative? The answer of pure logic is held to be that by the limits of our intelligence we are rigorously confined within the relative, and that anything transcends the relative can be thought of only as a pure negation, or a non-existence. . . . Unavoidable as this conclusion seems, it involves, I think, a grave error. If the premiss be granted the inference must be admitted; but the premiss . . . is not strictly true. . . . [T]here remains to be stated a qualification which saves us from the scepticism otherwise necessitated. . . . Besides that definite consciousness of which Logic formulates the laws, there is also an indefinite consciousness which cannot be formulated. Besides complete thoughts, and besides the thoughts which though incomplete admit of completion, there are thoughts which it is impossible to complete, and yet which are still real, in the sense that they are normal affections of the intellect.
. . . To say that we cannot know the Absolute, is, by implication, to affirm that there is an Absolute. In the very denial of our power to learn what the Absolute is, there lies hidden the assumption that it is; and the making of this assumption proves that the Absolute has been present to the mind, not as a nothing but as a something. Similarly with every step in the reasoning by which this doctrine is upheld. The Noumenon, everywhere named as the antithesis to the Phenomenon, is necessarily thought of as an actuality. It is impossible to conceive that our knowledge is a knowledge of Appearance only, without at the same time assuming a Reality of which they are appearances; for appearances without reality is unthinkable. Strike out from the argument the terms Unconditioned, Infinite, Absolute, and in place of them write, negation of conceivability, or absence of the conditions under which consciousness is possible, and the argument becomes nonsense. To realize in thought any one of the propositions of which the argument consists, the Unconditioned must be represented as positive and not negative. How then can it be a legitimate conclusion from the argument, that our consciousness of it is negative? An argument the very construction of which assigns to a certain term a certain meaning, but which ends in showing that this term has no such meaning, is simply an elaborate suicide. Clearly, then, the very demonstration that a definite consciousness of the Absolute is impossible to us, unavoidably presupposes an indefinite consciousness of it. It is obvious that Spencer’s definition of the Absolute as the Unknowable and his characterization of it as the ultimate religious idea put it in a very similar category to Wittgenstein’s mysticism in the Tractatus, with Wittgenstein archly attaching a prohibition to unknowability, unspeakability: that whereof we cannot speak we must remain silent. Jean-Paul Sartre simply denies the Absolute entirely. I still find this position more reasonable. Why? Well, looked at from a history-of-philosophy perspective, much of this talk of Absolutes and the like came from the theistic obsession. Would philosopher after philosopher have retrod the same ground so often were the lingering shadow of a deity not at their backs? Spencer’s agnostic stance to the nature of the Absolute was his one claim to non-atheism (he hated being called an atheist, since he asserted the Absolute in some form). Spencer, in his ethics, more thoroughly ungoded his thought. Many commentators have expressed dissatisfaction at Spencer’s self-imposed limits to ethical philosophy. Spencer did not believe there could be knock-down arguments in ethics. He believed that much of what made human beings better could only go on but slowly, with sentiments and not reason providing most of the ethical impetus. Other philosophers discarded this notion, searching (fruitlessly, I should add) for an argument or set of arguments that would convince not only other philosophers but inspire Everyman to be better. Ha! Spencer dismissed such notions as unrealistic. Similarly, all talk of the Absolute seems a throwback to the too-high expectations formed by the contradictions of theistic belief. But it’s worth looking at Spencer’s actual argument. How well does his argument for an indefinite consciousness of the Absolute hold up? If one switches the object of his implication argument, it falls apart. Talk of the Absolute implies the Absolute? No. This is merely a rehash of the ontological argument. Switch terms. Talk of, say, unicorns does not mean unicorns exist. Even more surely, talk of the unknowability of unicorns does not mean they exist. It only means that we can point in a certain ontological direction and fantasize, and share the fantasy. Talk of God as perfection was no better an argument for the existence of the perfect thing defined in our talk. Now some things implied by our speech are truly implied. It is an implication of our speech that words signify things. But signification is one thing; existence quite another. How much more accurate Santayana’s ontology, wherein imagined things and actual things are alike in essence, on one level (in the sense that we can meaningfully talk of them), but unalike in that some (most!) essences do not have an existent to root the talk into reality. More interesting is Spencer’s next tactic: It is impossible to conceive that our knowledge is a knowledge of Appearance only, without at the same time assuming a Reality of which they are appearances; for appearances without reality is unthinkable. He should have gone back to his talk of symbols. There he could have made this much clearer. Knowledge is the correct relation of signs to things signified. It is impossible to think of sign without the thing signified. But some signs merely point to other signs. Are the signs pointed to by other signs more real than the nearer signs doing the pointing? No. These are all signs, and at another level, concepts and the like. (Hence we speak of analytic truths as those entailed by a correct use of signs about signs.) Other signs do point to things that are not signs. Some of these are existents, like the keyboard I’m typing on as I write. But it is possible to think of another keyboard, constructed out of ice, but still working to put words on the computer in front of me. The signs that indicate the essence of this ice keyboard are all understandable. But there is no ice keyboard. Though we can comprehend the meaning of the imagined object, the object does not exist. And, it may be, cannot exist: ice is not a good material for making keyboards. So I deny Spencer’s premise about thinking in terms of symbols, towards the objects of my intention. I can imagine things that do not exist. Of course, the things that do exist are, together, called Reality. No problem there. It’s a handy abstraction for the sum set of all existing essences (to use again Santayana’s terms). Unreality might be the name for the sum set of (1) all error in identifying the real combined with (2) all fantasy. When it comes down to basics, it becomes apparent that in this kind of ontology — even one so hedged as Spencer’s, with the Absolute outrageously defined as Unknowable by its very nature — error and fantasy are ruled out as foundational possibilities. And thus error and fantasy enter in by the back door. So why not just dismiss Spencer as another of many failures? First, he’s worth reading because he’s a lot clearer than Hegel and That Crowd. Second, the first half of his argument seems quite sound; yes, knowledge is relative in that it relates changing relations of existents, and is itself relative to the objects of the symbols that we array to help us comprehend and map reality. Third, he’s given us the terms with which we can shelve the second half of his argument — all such absolutist talk — forever. Fourth, the context of the rest of his oeuvre provides us the humane perspective in which to advance any humble ontology (as his is). We do have limits to knowledge, and Spencer insisted on reminding us of this even as he made powerful generalization after generalization, even as he advanced theory, even as he tried to unify knowledge under a tidy set of symbols (conceptual scheme). Regarding Science as a gradually increasing sphere, we may say that every addition to its surface does but bring it into wider contact with surrounding nescience. There must ever remain therefore two antithetical modes of mental action. Throughout all future time, as now, the human mind may occupy itself, not only with ascertained phenomena and their relations, but also with that unascertained something which phenomena and their relations imply. The reality of existents and their relationships with one another imply, he says, another level of reality to which we do not have access. And this nescience of another reality is a humbling influence, which he not without precedent ascribes as religious. I have no small trouble with this, and on the ontological level reject the thesis. But in two senses, at least, he’s on to something. First, we do know that, the welter of phenomena being so complex, we cannot know everything. And our perspective, though less limiting than that of any other being we’ve met, still cannot get behind our modes of perception and the nature of our conceptual tools to experience things as those things might experience all that influences them. Yes, all around us our nescience is proved. Even as knowledge accumulates. Even amongst us thinking and feeling human animals, with our possibly innate abilities to empathize, not one of us can truly know what it is to walk in another’s shoes, to experience reality as the other experiences it. Empathy only goes so far. Extrapolation goes only a little further. We simply don’t know for sure. On lots of issues. But we must still acknowledge that the relations we aren’t tracking (and perhaps can’t track) still affect reality. Second, the accumulation of knowledge about existents and the vast array of their relations doesn’t say anything of how we feel about them. We value some things more than others. And we often step back and lump things together and value the bigger lumps. And then we compare them with our fictions. And we loll those fictions on our minds, casually, sometimes hour after hour. And then the fictions become an obsession. And against the fictions (or our errors about reality) actual reality can seem pretty grim stuff. And in this yearning for something better, something other than reality, we contemplate new possibilities, and even take previously unthinkable actions. Religion? Yes, religion is (well, all past religions are) built on fictions. And much of it is offered as an alternative to reality. Not in the hifalutin’ sense that Spencer ontologized about, but in the everyday sense. Fibs, if aesthetically pleasing. That this kind of religion is in error is no surprise. It is born out of fantasy. But because of the fantasy, we create new things, bring new things into this world. Just as religion helped fix the mind away from some of the grimmer realities of the past (death, suffering, etc. ), literature can supplant some of the grimmer realities of religion. And the new values engendered by either or both have helped transform the world. You don’t like the grime of the world: clean up. You don’t like the grim nature of death: imagine longer life, imagine afterlife, take your mind off it, or put your mind to ameliorating it. The goal of eternal life may be unattainable, but it may have — divorced of some of its stricter religious solutions — led to the actual means of making life and the process of death less horrible. We once merely imagined long life unencumbered by disease. And now, eons later, we are closer to living that ideal, once merely imagined. A failure to solve the problems of metaphysics must always remain a failure, in spite of all protestations that it was inevitable; and it in no wise justifies itself an advance to so self-contradictory an asylumm ignorantiae as the Unknowable. In the edition of his First Principles, published in 1900, Spencer adds a postscript which shows some consciousness of the contradiction involved in his knowledge of the Unknowable, and finally contends that his account of the Knowable in part ii will stand even if part i be rejected. Even this, however, understates the case, seeing that a really inscrutable Unknowable would destroy all confidence in the order of nature and render all knowledge entirely precarious. Well, no. This last point is the baldest of assertions, making Spencer look like a cautious analytic philosopher by comparison. So many assumptions are packed into it that it’s not even worth bothering with it in detail. I bring it up to demonstrate the kind of thing that gets hurled at Spencer’s writing with such regularity. The knowledge of the order of nature is self-reinforcing, by near-constant public criticism and by the success of its use in technology and prediction and retrodiction. Beliefs are made precarious by proven error. And beliefs are made precarious by values. But a theory of underlying reality? Its cash value is preciously close to zero. Further, a failure to solve the problems of metaphysics is, as Spencer clearly states, a failure in the much-praised precursors to Spencer. That these errors are said by Spencer to be inevitable is not so much a justification but an explanation. And it is one that I take to heart, in that I regard the failures of metaphysics to be largely a matter of not confronting the continual possibility of error, the pervasive nature of fantasy, and the never-ceasing waves of evaluative judgments lapping at every signpost of truth. It’s true, Spencer’s metaphysics is a failure. But his metaphysics was a metaphysics of limits and limitations, and when we clear away all the error and mistaken fantasy from ontology, epistemology, and cosmology, making for a more stable metaphysics, those in the past who erred in the endeavor, but expressed humility and insisted on limiting the purview of our views and perspectives, instead, these philosophers look a whole lot more responsible than others do. Yes, the Unknowable is a clunky device. But our nescience does eternally surround us. And if I let the errors of religion go, that doesn’t mean I’ll let fantasy go without some respect. And if we let acknowledgement of nescience and contemplation of fantasy round out our humanity, well, isn’t this in some sense religious? Humanist, anyway. Inevitable, I think, in a thinking human who also must harbor and express emotions at each breeze and faint odor of the slow and the quick.